Some new Arabic Calligraphy work. 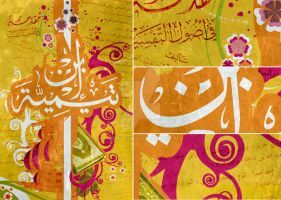 This one says "Inna Allah Jameel Yuhibbu Al Jamal"
can u please tell me what kind of technique that is, i mean how u get the different colours in that different light shades/layer, did u take a template? what stains painting colours u took. forgot to say ur paintings are mashallah amaaazing! How can i purchase this for printing? I need to print it in 31*42 cm size, would it show high resolution? Can I purchase this beautiful piece as a print? how can i get it or download a high resolution online?? This piece is not available for download or in a higher resolution. Is this piece available for purchase as a print? Really beautiful, it boosts me up do get back and do some calligraphic work. Yeah I know, it's a matter of practice only, so you're Arabian right? AHa, so where are ya from?